Every penny counts. Every cent matters. Even if your business is successful, you don’t have money to waste. This applies to all types of expenses, including the maintenance on your commercial building. One of the most common problems with commercial buildings involves the roof. You’ll try to stretch the life of your roof as long as you can. But sometimes, the damage can’t be repaired and you’ll need a full roof replacement. This process is an investment but you shouldn’t have to waste thousands of dollars. Liquid roofing is the answer. You can easily extend the lifetime of your commercial roof at a fraction of the cost by taking advantage of liquid roofing. Here’s why you should call Champion Services Roof Rescue before you make any decisions on replacing your commercial roof. It’s vital that you take a careful look at your roof before you ask a commercial roofing contractor to start any type of roof restoration work. Taking stock of the damages beforehand may save you from paying for labor costs down the road. Start by conducting a preliminary examination from the ground to look for any gaps, holes, or cracks around the perimeter of your roof. If know you have leaks, mark the areas or make a note where the leaks are happening. A commercial roofing contractor will take a much closer look when they come out for an inspection. They’ll check to see if the flashing is rusty, cracked, or damaged. What about the vents on your roof? Are the sealants holding up or are they wearing away? Once the inspection is completed, your commercial roofing contractor will begin the roof restoration work. 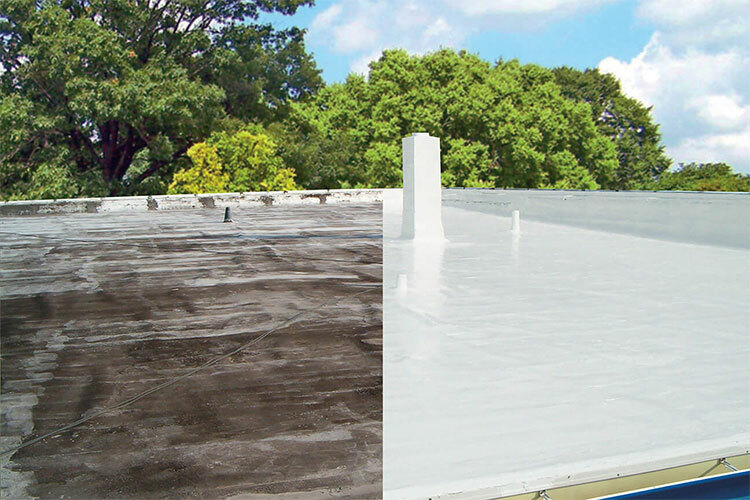 For commercial properties, liquid roofing coatings are the best option. The coatings used in liquid roofing will make your roof look new and fresh at a fraction of the cost of a traditional roof replacement. Liquid roofing coatings can be applied to almost any type of roofing material. It’s energy-efficient and provides ultraviolet protection. They also have elastomeric qualities, meaning they self-seal so any cracks, cuts, or punctures will fix themselves automatically. If you’re interested in seeing how liquid roofing can change your flat roof for the better, call Champion Services Roof Rescue. Request a quote today!